Providing you the best range of wire grid resistors with effective & timely delivery. 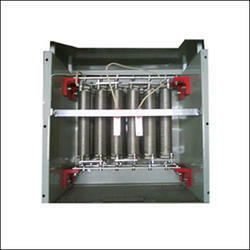 Construction:In these type of resistors fecral wires are used. Wire is formed into grid by bending wire in zig -zag form. Multiple grids are assembled as a bank and then fitted in an enclosure. These resistors are most suitable where high wattage and high current is required. Looking for “Wire Grid Resistors”?